We just wrapped up our second week and everyday I am blown away by the dedication from our participants. They are not only completing their assignments but showing so much enthusiasm and really stepping outside of their comfort zone by trying new species, cooking with whole fish, and asking tough questions in the marketplace. While it certainly hasn't been easy to find many or their assigned species we have heard positive feedback from some participants that because of the interest they have shown in purchasing local species some markets are promising to start carrying more local fish! "Initially, I had a little trouble but the folks at Sanders are just great. They were supposed to get some Hake in, but that didn't end up happening but the lovely gentleman remembered when I called for the hake that "you were also looking for tautog, weren't you?" and they had some coming in that day (Friday) that would be cut on Saturday. I came in on Saturday afternoon, just before going to my friend's cookout, and was presented with 2 beautiful 1-lb fillets. A little more than I was hoping to spend, but they were gorgeous and would be a hit at the cookout. I made a little foil packet, with butter, salt, pepper and lemon and threw the tented packet on the grill for a little less than 10 minutes and put the fish over a bed of similarly cooked fiddleheads. WHAT A HIT! People wanted to know WHAT I'd done (next to nothing) to this fish, why it's so good and omg fiddleheads (that I actually bought AT Sanders). Easy to cook, good flavor and texture and a few people actually had heard of Tautog (I previously had not)." "This week by fish list had me searching for Herring, Dab, Winter Flounder and Butterfish. Seeing how I have never seen most of these fish in the two markets closest to my house I decided to hit Tony's Seafood in Seekonk for their large selection. I ended up purchasing the Winter Flounder- 1 lb. at 10.99 with Flounder Picatta in mind! The fillets were small but firm. I dipped them in beaten egg whites and panko then dropped them In a hot pan for a light fry. Making the picatta sauce on the side, consisting of butter, white wine and chicken broth. After reducing to half and adding the delicious briny capers it was time to plate! I laid the Flounder over a bed of arugula topped with the sauce, sliced lemon and parsley. Everything was wonderful the fish stayed together so nicely and with its delicate flavor paired so well with lemon and wine picatta sauce. Overall this was a lovely fish to work with. Not difficult to find, reasonably priced and most importantly delicious!" "It had been some time since I last gutted and scaled a fish. You must take it outside to scale otherwise it will be messy inside your kitchen. Also, make sure that you have a sharp knife to slice through the fish to gut it. I chose to use a Caribbean pan fried fish recipe for the Scup. The recipe was easy to follow and the fish came out perfect. It was very delicate in texture and very sweet. You must be careful of the many small bones. So we ate it with our hands . Not really a company meal, unless you're camping or having a cookout. It was very inexpensive and served with a nice salad makes a fine meal. I would buy it again." "My girlfriend and I are both partaking in this program so I get to hear about 8 fish each week rather than the usual 4. One thing that has certainly come out so far is that our local markets (as I cannot speak for all of them) are very particular of which fish they sell on how well they can move them and how easy they are to handle. For instance, my girlfriend has had a John Dory twice already and in speaking with the fish markets they all said the same thing, "the fish is tough to work with. It has large spines, very thin, and only gives a very small fillet. 90% of the fish is thrown away." Hearing things like that makes it easy to see why markets wouldn't want to sell something like that, it isn't very practical from their standpoint. A few of the other species we have had, (razor clams, ocean perch, tautog, to name a few) the shop owner indicated he could get at the fish market if we wanted them, however we would need to buy a large order of it to make it worth it. He would have to buy the fish in 50-lb lots, or razor clams by the half bushel, and based on his knowledge of the local tastes he would sell a few pounds and have to discard the rest. From his description it appears that there isn't the local demand for many of these species. Finally the last thing that has jumped out at me is that there is difference between the common name and the market name of these fish. For instance, they only know Tautog as "black fish" and many have never heard of a cunner, sculpin, ocean perch, or smooth dogfish. Looking forward to coming week I'll have to do my research on the more common market names for my species." "I've used this recipe on other white fish. The hardest part is making sure you have parchment paper. Lay the fillet on a large piece of parchment. Sprinkle work black olives, halved cherry tomatoes, capers and shallots. Salt and pepper and olive oil. Close parchment and bake for 40 minutes at 350 degrees. I served it with roasted butternut squash cubes and wild rice." "This week I tried butterfish. It tasted good but so many small bones made the fish difficult to eat. My husband was laughing and me picking through the meat saying that's what you get when you eat bait!" "For this week my seafood choices were white hake, Jonah crab, razor clams, or bluefish. The only type that a store carried was bluefish from Rhode Island. Bluefish are voracious predators. They employ a feeding behavior call the “bluefish blitz” where large schools of big fish attack bait fish near the surface, churning the water like a washing machine. One resource described bluefish as an “animated chopping machine”. They are aggressive feeders making them easy to catch. They also put up a good fight for anglers. But they seem less desirable as a meal. Just as for all extremely active predators, their meat will spoil quickly due to their powerful digestive enzymes that are activated by the bait they ate. They need to be cooked soon after being caught. They also have darker meat and a blood line along the dorsal fin that gives them a strong flavor. But they are very nutritious to eat full of Omega-3 fatty acids and a good source of selenium, magnesium, and other minerals. All my research had me very wary of how bluefish would taste. So we chose to blacken the fillets in cast iron using a homemade blackening seasoning with paprika. The fish was very good with no strong overwhelming fish taste or super oily texture. I think it is a testament to the local fish market. I would eat bluefish again." Grilled Dab; So Soft You Can Eat It With A Spoon! "This week finding my fish was a little more difficult but was happily surprised with my success in the end. Allow me to explain... of the species I was tasked with buying, John Dory was one of them, and also the fish I bought, cooked and enjoyed last week. I went to Harbor Fish Market and found that they had it again immediately. The price remained the same as the previous week ($8.99/lb) , but before buying it I wanted to see if I could find a different fish from my list. Unfortunately they did not have any of the other ones, so I decided I'd check another two markets and if I didn't find them, then I'd come back to get the John Dory. The week went on and I checked two other fish markets, and one explained how they carried John Dory usually, they just didn't have any when I was there, and the other insisted all they had left was hake and cod. Neither of these markets had any of the other fish I was looking for. I returned to Harbor Fish Market to pick up some John Dory and I got to talking to one of the women behind the counter about the other fish I was looking for (I didn't see them out/displayed anywhere). I am so glad I talked to her because as it turns on they had two of the other species I was looking for, Dab (American Plaice,), which she informed me is also called lemon sole, and was labeled as such behind the glass under the counter, and Tautog (black fish). The Tautog was available as a whole fish, but she said they could clean it and cut it up any way I liked. I was deciding on which of the new species to try when they sold out of the Tautog, so my decision was more or less made for me; this week would be Dab. It was such a surprise to me when I returned to that first market and found three out of my four fish were there. I learned it is always worth talking to the folks behind the counter about fish you want and you are either not familiar with, or fish you want and don't see displayed because apparently they may also just have another name, and/or are kept in a different, less visible area. Additionally, they may just have sold out, or are coming in later that week. Although I had never cooked this type of fish before it looked like your standard fillets of fish, which made it less intimidating and easy to cook with confidence. I decided to stick the pieces of Dab on a greased baking pan, with some butter, juice of a lemon and parsley, and throw the pan on the grill (medium heat for about 15 minutes). It smelled so good! They came out great and I enjoyed it. The taste of the fish itself is extremely mild, so next time I think I would add more herbs and spices before cooking it. I couldn't believe how soft and smooth it was and how it almost seemed to melt in your mouth. While I enjoyed the Dab, I think it would work best in a chowder, or in a pasta dish. The incredible softness after it was cooked left behind gooey pieces on my plate, which would have been soaked up nicely in something like a chowder, or any pasta dish ( perhaps certain vegetables too), where it would stick to/coat the pasta as a sort of additional sauce, plus still have the bigger pieces of fish to enjoy too. Pasta with Dab Balls! Well, that doesn't sound exactly as appealing as pasta with meatballs, but you get the idea. Overall, I am happy I found it, try it and know it better!" "I went to a couple of regular supermarket to get a feel for their selection of local fish. As with last week, they had little to none that could be verified as locally caught. I then went to an Asian seafood market because I had heard they tend to have a selection of local fish. The fishmonger told me they do get locally caught species, but you take what you can get when you can get it. I found the mackerel here. He also asked if I was using it as bait! When I told him it was my dinner, he graciously offered to clean it for me!!" "I am a fan of mussels and prefer wild local to the small farm raised ones such as PEI's . The Catham wild mussels I got at Cape a fish and Lobster were the plumpest ones i've ever seen! I don't know if it's the time of year or what they are feeding on but WOW! If you are a fan I urge you to go pick some up. They are sweet, briny with just a touch of mineral tang. I prepared them in the was Black Fish restaurant does. With toasted fennel, sausage, onion in a ️️milk broth ( like a chowder) . Yum !" "Growing up, I didn't eat much lobster. Because it is often expensive, lobster was seen as a treat in my family, only eaten in restaurants during summer months. I was excited/apprehensive to see lobster on my list this week. I really wanted to try to cook it on my own but as someone who is predominately vegetarian (with the exception of seafood, which I don't typically cook at home (other than for this project)), I was nervous about having to deal with a live animal. Everything ended up going off without a hitch, but it took me longer than it probably should have because I was so nervous. At first I was just going to mix the lobster meat with some pasta and a white wine sauce, but then my husband suggested a lobster roll. I had my first lobster roll 3 years ago on a trip to Maine and I absolutely loved it. Since then I've been chasing my first lobster roll "high". I found a recipe for lobster rolls online at Bon Appetite's website and was quite happy with the results." "For week 2 of #eatlikeafish my four species to search for were: squid, mahi-mahi, white hake and #haddock. Squid and mahi-mahi were out because I picked squid last week, and mahi-mahi is not local to New England waters during this time of year. I was unable to find white hake, so haddock it is! Haddock, is a type of groundfish species that is found primarily from Maine to New Jersey. Haddock are a member of the Cod family, but can be distinguished by a black “thumbprint” found on the side of their body and they have a black lateral line. Two of the haddock stocks found in US waters are from Georges Bank and Gulf of Maine. Commercial fishing for haddock occurs year round in the US, with bottom otter trawl fishing producing the majority of haddock landings. Longline, and gillnet fisheries land the remainder of the haddock catch landings. Fishermen follow a number of measures to reduce impacts on habitat and bycatch. In some areas, fishermen use a “Ruhle trawl” to reduce catch of overfished groundfish, while allowing them to target more abundant stocks such as haddock. Ruhle trawls have a large 8 foot mesh in the forward end of the net, which allows cod and other fish to escape. Adult haddock are benthic feeders, with a diverse diet that includes bivalve mollusks, amphipods, crabs, shrimps, sea stars, sea urchins, sand dollars, and occasional fish eggs. Juvenile haddock are often eaten by elasmobranchs (spiny dogfish, skates) and many groundfish species (cod, Pollock, cusk, white hake, red hake, silver hake, halibut and sea raven). Haddock has a slightly sweet taste, and a firm but tender texture. Haddock is a great source of low-fat protein, magnesium and selenium. I made baked haddock fillets with horseradish-chive potato mash with a side of green beans. Yum! Recipe was found from “Fresh Fish: A fearless guide to grilling, shucking, searing, poaching, and roasting seafood” by Jennifer Trainer Thompson. I substituted some Cape Cod Potato Chips for breadcrumbs, because after all I’m on #capecod and that’s #capeliving ?? Follow along for next week’s #fishtale #eatfish #eatlocal #bestwhenfresh #eatingwiththeecosystem #knowyourfisherman #piertoplate #localseafood"
"I struck out at 4 local spots...so I traveled to Bridgeport hoping to up my odds on the shoreline. Again, nothing. So I called around (I had free time up until this week). I used to live in Middletown and remembered CityFish always seemed to have a wide selection. Turns out they had it...so I drove 50 minutes to get it. After striking out last week I was determined to find at least one of my fish this week =) I normally hate fish tacos...but I always order them because I feel like I should like them. I love tacos...I love fish. So I discovered the secret this week...MAKE IT MYSELF =)...oh, and leave out the cilantro!!! Being on a low carb diet these days, I got creative making the tortilla. I used what I like to call "fread" (faux bread). Others call it cloud bread. Essentially eggs, cream of tarter, cream cheese and in this case, garlic salt. Then I made a delicious avocado/jalapeno crema which I mixed with a dry coleslaw mix. ...and A LOT of lime. Tip...eat it all that night, no matter how much lime juice you use the next morning it will look ummmm....well, let's just go with unappetizing. Marinated the Haddock in olive oil (a mistake when broiling..so I shifted to baking when I realized the mistake) lime zest, red pepper flakes and cumin. I'm making this again!" Chop onion and saute in olive oil and sesame oil at medium heat until onion begins to brown. Mince garlic and slice jalapenos, then add to above and saute for a few minutes. Add vegetable broth and curry powder. Bring to a low simmer. Add enough coconut flour to thicken slightly. Thinly slice green onion bulbs and add to curry mix and saute for a few minutes. Separate turnip bulbs from greens and quarter. Chop turnip greens. Add both to curry mix and saute a few minutes. Slice spring onion greens into 1 inch pieces and add to curry mixture. Add salt and pepper. Reduce heat to very low simmer. Brush flounder pieces with olive oil and dust with coconut flower and paprika. Heat cast iron skillet over very high heat until smoking. Add coconut oil to just coat. A heat resistant brush can do the trick to spread the oil. Sear flounder filets a minute each side or until slightly charred. Use two spatulas to flip to avoid breaking filets. May need to add more coconut oil between frying each piece. Bring curry mizture to a bubbling simmer, add flounder and mix to coat. "I had a memorable time searching for my assigned fish this week. I went on an adventure to Cape Ann with my mom in celebration of Mother's Day and we had a blast cruising through Gloucester in search of whiting, weakfish, striped bass or swordfish. We met locals along the way that pointed us in the direction of Turner's Seafood just outside the town center. We met with the team at Turner's and discovered that their swordfish was fresh from off the coast of Cape Cod. The team was excited to learn about our project and to see what future fish assignments came my way. They encouraged me to return so they could share more local information about the boat and the fishermen that work hard to provide native fish to their markets." "Here it is Week 2 and once again I was not surprised that I would not find Pollock or Mackerel. I am surprised that the mussels I found at the fish market came from P.E.I. and not from around where I live. Last week's fish and this week's clams that I bought from the fish market both came from Stonington, CT waters. I have been purchasing my clams previously from Costco Wholesale and since they are warm water clams I could never eat them raw but always made them into clams casino. I was able to enjoy the clams this week raw because they came from the fish market. Yummy! My husband and I enjoyed a dozen clams raw with lemon and cocktail sauce, and the other dozen we made into clams casino. The clams had so much more flavor than the ones at Costco. I will be purchasing my clams from the fish market from now on." "Haddock is so easy to prepare and tell when it is fully cooked. It is the perfect beginners fish but can also be used by professional chefs. It is a typical fish and chips in NE and appeals to most people since it doesn't have an over powering fishy taste. I prepared mine by putting some lemon juice, black pepper and butter with the fish wrapped in tin foil and put on the grill. It came out super flakey. I paired the fish with jasmine rice and asparagus cooked with bacon and garlic. The dinner was well liked by the whole family, even my two young kids (4 and 1)!" "It was my first time buying fish from a farmers market. It gave me a chance to discuss local fishes with local distributors and he was quite knowledgeable on the topic. I look forward to building a relationship with him and his cohorts as well as to further my fish intellect." For more information about the project and to follow along on some of our participants personal blogs check out our Eat Like a Fish page and #eatlikeafish. check back next week to see what our participants have been up to! Eat Like a Fish Citizen Science Project Week 1! The Eat Like a Fish Citizen Science Research Project officially started last week! We sent over 90 citizen scientists, from all over New England, to search for local species in the New England marketplace. Each participant was randomly assigned four local species to search for and if they found one or more of their species they were asked to pick one and take it home to cook with. We have amazing participants who together made almost 200 market visits this week! About 60 percent of our participants found at least one of their assigned species. While some participants were disappointed that they didn't find their species, their efforts are super important and will provide us with information to help get more local species available in the marketplace in the future! "This week I choose sea scallops from my fish list. They were very easy to find and were caught locally in New Bedford, MA. After a quick rinse I slid them into a hot oiled pan with just some salt and pepper. 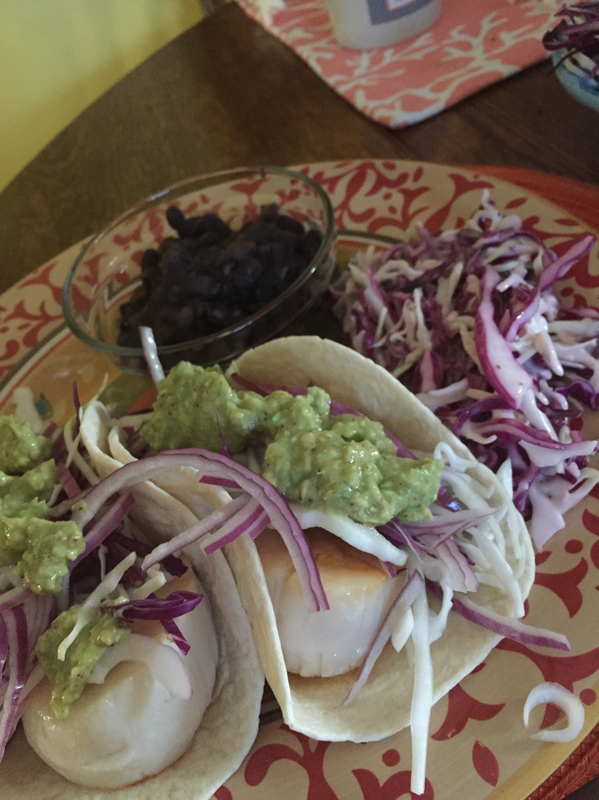 With my husband and daughter eagerly awaiting dinner I assembled the Scallop tacos. Soft tortilla followed by a smear of an avocado sauce I made with some mashed avocado, lemon juice, dash of vinegar and salt and pepper. Add the scallops with some thin sliced cabbage and red onion. Yum!" Saute garlic in olive olive. Add jalapenos, sesame oil, rice wine vinegar and saute 2 minutes. Add squid and saute until rings just begin to curl. NOT ANY LONGER. Sample rings for doneness. Turn off heat. Meanwhile, cook pasta according to box directions. "This past week I bought, cooked and ate John Dory, a fish that I had never heard of or tried before, and it was delicious! I was surprised to see it so prominently displayed at the fish market, as I thought it would be more difficult to find after not being able to find it at my local Whole Foods (they usually have what I am looking for and provide me with the relief as a consumer that all the fish they carry and sell are sustainably sourced). I rinsed the large pieces of the fish and cut them into portions sufficient to satisfy each person I was serving. The meat of the fish was Then but easy to slice through, however the skin was pretty tough and took a little extra elbow grease to get through. After cutting, I dipped each of the pieces of fish in egg and bread crumbs and fried em' up. A few friends of mine, who are also eating with the ecosystem, and I decided to all get together for a fish feast, where we all cooked our own fish, in our own way and shared a wonderful meal together. It was a lot of fun! The man at the fish counter at Whole Foods said that John Dory was similar to flounder and after eating it, I do agree with his description. I actually liked it more than flounder in account of its firm, and smooth texture and juicy, meaty taste. Not overly fishy and not at all bland. I think it has a more universal appeal in terms of the experience of flavor for the average fish eater. Overall, a positive buying, cooking and dining experience." "This week my four species to look for were weakfish, sea urchin, haddock, and sculpin. The only one that any of the stores I contacted had was weakfish. It was also a species I had never eaten. The weakfish gets its name from its tender jaw that is easily torn by fishing hooks. But this fish is known as other names. A more marketable name used is sea trout, and the Narragansett Indians call this fish squeteague. Weakfish is a member of the drum family, and like other drum, it makes a grunting noise by vibrating its swim bladder, but this only applies to males. It seems since the 1800’s that weakfish populations seem to come and go every 20-30 years. Recent accounts of anglers seem to indicate that the numbers might be increasing. I bought the weakfish whole and with the head, but had it cleaned and gutted. The recipe I used came from The Shelter Island 36 cookbook (http://www.theshelterisland36.com/). The book has a collection of New England recipes and is illustrated beautifully. I steamed the whole fish in aluminum foil with aromatics such as lemon and garlic inside and on top of the fish. It was very good. The meat was moist and had a light delicate texture. It was paired with cous cous and green beans. My partner has saved the head for a later meal, and he fried the bones to eat." "We ended up finding conch at our 4th seafood market, Champlins in Narragansett. They were available both in and out of the shell. We choose to go ahead with the shell to get the whole experience. We bought 4 total, which was a little under 2 lbs and cost a total of $8.50. The meal we found right away online was for a Caribbean style rice dish so we went ahead with that since we had most of the other ingredients already. The 1.75 lbs was actually way too much and our meals were huge since we were not expecting so much meat in there. Price was right. It wasn't very hard to cook, and I feel you could do a lot with it. Taste is really good but it was definitely chewy so I could see how people may be put off by it. Next time we may need to try a better technique than steaming." "I was pleasantly surprised by the taste of Ocean Perch (Acadian Redfish) - That's the first thing I learned (2 names for the same fish). Asking the fish counter about where their fish comes from was an adventure in itself. The man at Big Y was actually a fish buyer in New York working part time evenings at the store. Who would have guessed, if I had not started explaining to him about this citizen scientist project, I would never have know that such a knowledgeable person would be helping me first hand. Looking forward to next week!"